CHEST PAIN? IT COULD BE ANGINA? At London Doctors Clinic, we often see patients that are concerned about the health of their hearts. That’s why we’re dedicating this week of blogs to some of the most common heart-related conditions, and how to keep this organ in tip top condition! How Much Do You Know About Angina? Angina is the feeling of constricting pain and pressure in the chest, due to a lack of oxygen supply to the heart. The most common cause of this lack of oxygen is coronary artery disease, where the arteries supplying the heart become narrowed due to the gradual build-up of fatty plaques (which restricts the amount of blood flow to the heart muscle). As you can imagine, the muscles of the heart are working non-stop – so they require a constant, reliable supply of blood to provide the energy for all this hard work! That said, in some cases angina can also be caused by heart failure and anaemia. Coronary Artery Disease (CAD, otherwise known as Ischaemic Heart Disease) is characterised by plaque build-up in the vessels supplying the heart, which thicken the walls of the arteries supplying the heart, and decrease the diameter of the vessel. Angina can also be caused by the arteries supplying the heart (known as coronary arteries) suddenly going into spasm – this is called coronary artery spasm. This causes angina-like symptoms, but in patients with no sign of coronary artery disease (plaque-thickened arteries, as mentioned above). This is much rarer, and the cause is unclear. However, one substance known to cause spasm of the coronary arteries is cocaine, and abuse of this substance can lead to angina-like chest pains. Additionally, certain medications affecting your blood vessels may exacerbate angina, and may bring it on episodes of angina symptoms. Angina can be classified into two main groups: stable and unstable angina. The classic symptom of stable angina is chest discomfort or pain brought on by physical activity, as well as other ‘triggers’ such as stress, cold weather, and heavy meals. This pain is alleviated after a few minutes of rest, or medications such as a ‘GTN spray‘. In contrast, unstable angina can occur with rest, and symptoms are more severe and prolonged than stable angina. The difference between these two types of angina can be explained by the character of the plaques in the coronary arteries. And, put simply: the more plaque in the arteries, the worse the symptoms. The doctor may also note an increase in your blood pressure and heart rate during episodes of angina. If you experience any of the above symptoms, you must seek medical help immediately, as you could be having a heart attack. Call 999 or NHS 111, depending on the severity of your symptoms. In any case, episodes of new chest pain should be investigated immediately by medical professionals. Angina can usually be diagnosed by your doctor or private doctor, based on the symptoms mentioned above, although in some cases your GP may recommend an ECG (electrocardiogram) to help make the diagnosis. ECG readings should be normal in these patients while resting, however if angina is suspected, your doctor will usually organise an exercise ECG, which will show if the heart muscle isn’t receiving enough oxygen. The first-line medicine in treating the symptoms of angina is called GTN, which works to dilate the blood vessels, and increase blood supply. It also acts to reduce how hard the heart is working, and therefore how much blood supply and oxygen the heart muscle needs. GTN can be given in combination of beta blockers and calcium channel blockers – two common heart medications, which also help to decrease the workload of the heart. Although these medicines help to relieve the symptoms of angina, they do not treat the underlying problem, which is the narrowed coronary arteries supplying the heart. Preventing future events requires more invasive surgical treatment such as balloon angioplasty. During this procedure, a wire is fed via the groin into the offending coronary blood vessel, and a balloon is inserted and inflated to widen the vessel. Often, a small mesh known as a ‘stent‘ is also inserted into the vessel, to help maintain a wider width. If the above is not possible, then a procedure known as a ‘heart bypass‘ is also considered. This involves transplanting a healthier vessel from another part of the patient’s body (usually the leg) to the heart, to bypass the offended plaque-ridden arteries supplying your heart and provide a more reliable source of blood flow. This operation is commonly referred to as a ‘CABG‘ (entertainingly pronounced ‘cabbage‘), short for Coronary Artery Bypass Graft. In addition to these serious surgical interventions, there are a lot of measures patients can take themselves to help improve their heart function. These include low intensity exercise (such as going for regular walks) which may act beneficially by decreasing high blood pressure. Better control diabetes (if diabetic). 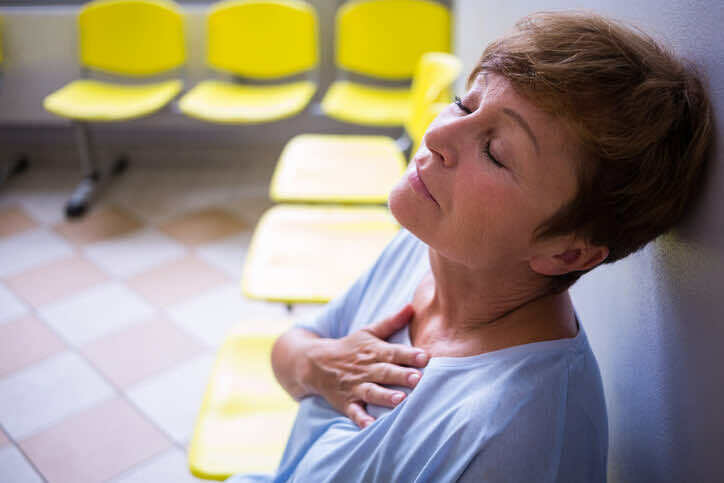 These measures can help manage the symptoms of angina and, although it is estimated that 100 million people in the world are suffering from the condition, most can live a good quality of life with few limitations on their daily activities. If you’ve had any concerns regarding your heart health, our experienced doctors at LDC are here to help! We recommend booking a 30-minute appointment, during which our GP’s are able to perform a baseline ECG then and there. We can also facilitate a range of blood tests to investigate your heart health, as well as provide specialist referrals to consultant cardiologists, if necessary.